Playsafe New Question on the Playground: Where Are the Slides? The tall, straight slide that used to sit in the big children’s section of American Playground in Brooklyn inspired many similes. Really tall, like a mountain, according to 7-year-old Olive Vogel. Or really fast, as if you’re in a sled. The welding between the siding and the bed of the stainless steel slide came apart in spring 2016, Ms. Mead said, exposing a razorlike edge sharp enough to cut a child’s hand open. She reported the break to the city that April, and the slide was removed in July. 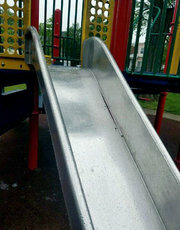 Nearly 100 more slides of the same model — the Lightning Slide, distributed by the Pennsylvania-based company Playworld — were removed from New York City playgrounds in December and January, part of a manufacturer’s recall after the same break that Ms. Mead and her husband noticed amputated the fingers of two children, according to the Consumer Product Safety Commission. Approximately 1,300 slides, sold from November 2000 to October 2016, were recalled, according to a statement by Playworld. The company said it was aware of 13 broken welds. New York City did not receive reports of any injuries on the recalled slides, most of which were in Brooklyn. The company did not respond to requests for comment. Still, the recall illustrated a long-contentious issue in city parenting circles: playground safety.